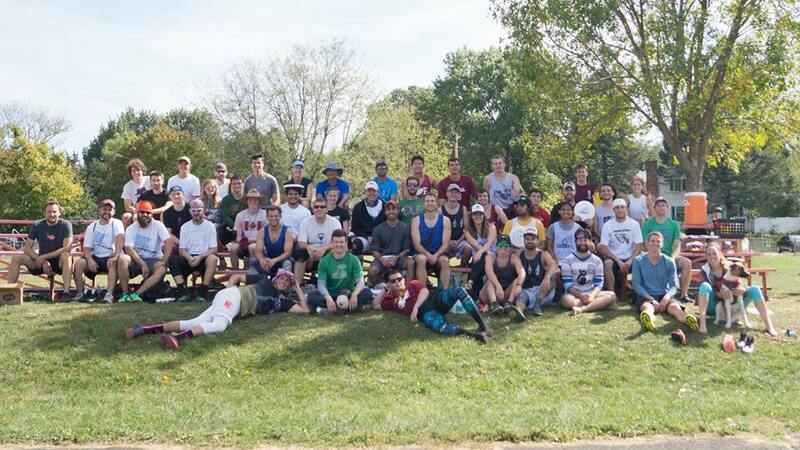 This year’s Fall Hat Tournament wasn’t quite our biggest but it may have been our funnest! With around 45 participants this year (including 27 pre-registers who all got free koozies!) we had 4 or 5 subs for each team, which goes a long way on a surprisingly warm, late September day. This, along with a lot of close and spirited games, certainly made the games a lot of fun but what set this hat tourney apart from all our others was what happened between the games. For the first time ever, we held fun competitions between games for prizes. Competitions included foot races, farthest hammer, “Chuck -A-Disc” (similar to Chuck-A-Puck) and our favorite spirit game, Up/Down. Winners were able to take home a CRU jersey, disc or koozie. Jealous of their awesome gear? No worries, you can get your own at our merchandise page. 2017 Fall Hat Tournament Champs! And yes, among all the prizes, competitions and spirit games we did play lots of Ultimate as well. Team #3 ended up winning all of their games in our round-robin style tournament. I never heard if Team #3 came up with a cool team name for themselves, but if you know what it was (or you know what it should’ve been) you can share in the comments. Fun was had by all but most importantly, CRU was able to raise around $500 to support our programming, which includes teaching youth to play, regular pick up games and financial support for local teams and coaches. We’re working hard to grow the support of Ultimate locally and we can’t do it without the involvement of our awesome community (and sometimes all we ask you to do is play Ultimate!). Thank you to everyone who came out to play. We hope to see you all again soon.